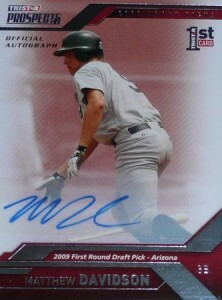 Drafted by the Arizona Diamondbacks with the 35th overall pick in the 2009 MLB Amateur Entry Draft, Matt Davidson is a Top 100 Prospect according to Baseball America. He was the MVP of the 2013 Futures Game, thanks to a two-run, go-ahead home run that helped solidify the win for the U.S. team. Participating in the Triple A All-Star Home Run Derby, Davidson connected for 11 home runs to win the title. Although he's still working his way up through the minors, collectors already have several Matt Davidson cards to choose from. 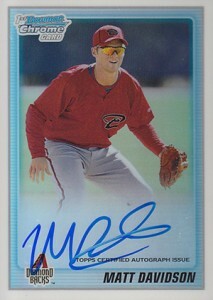 Shop for Matt Davidson cards on eBay. Davidson has displayed tremendous power throughout his young career. Not content to simply hit the long-ball, he has also worked on his plate discipline and shows signs of being able to hit for average and to execute situational hitting needs when called upon. An above-average fielder at third base, Davidson is versatile enough to play multiple positions. 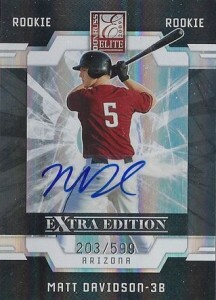 Collectors have plenty of Matt Davidson cards to choose from when it comes to getting in early on this gifted hitter. The following is a list of key Matt Davidson cards released prior to his MLB debut. As a result, none can be classified as official rookie cards, though they are extremely popular nonetheless. 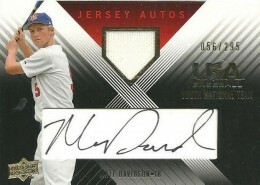 Davidson's first mainstream card, it features a game-used jersey swatch, cut autograph and is serial numbered to 295 copies. This is one of his key early cards and depicts him as a member of the USA National team. An affordable base card from a licensed product, collectors can also chase a wide array of refractor parallel versions of this card as well. Unfortunately, their is no autographed version of the card. Serial numbered to just 206 copies, this card would be a cornerstone from which to build a player collection. 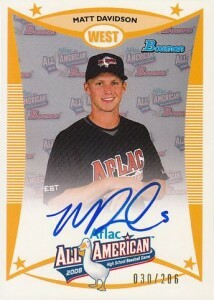 Signed the previous year at the 2008 AFLAC All-American Classic, there are actually two versions of the card. Pack-inserted copies carry the serial number. Players were also given copies for themselves. These are not serial numbered. A great looking card, it features an on-card autograph and is serial numbered to 599 copies. It is one of the more affordable early Matt Davidson autographs. It is also available in several parallel versions with smaller serial numbering. Another affordable autograph, this card is serial numbered to 199 copies. Tristar may not command the highest values in the hobby, but for those more concerned with a signature, these provide solid value. 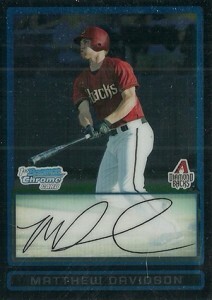 The first Matt Davidson autograph to feature the slugger in a Diamondbacks uniform, this will forever be one the top Matt Davidson cards. It is also available in several Refractor parallel versions.